The year has begun down in the south with a heatwave of catastrophic proportions. Hot and sticky, overwhelmed and saddened by the losses that have incurred to people, livestock and environment as well as being on constant alert for fire here, is not all that conducive to creativity. It seemed for a bit that that that also was all burnt out. Nothing new was being created and worse still ideas seemed to be stagnant. 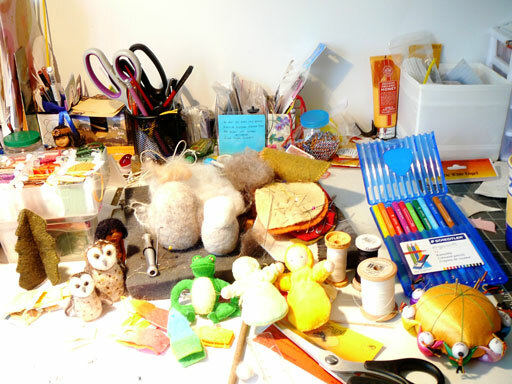 However taking stock and actually making a picture of the craft room table revealed that things did seem to be muddling along. There were indeed a couple of new items and things that had been put aside, those ubiquitous U.F.Os, were getting finished. In fact looking at the photo made me aware that there had been some progress as well as some inspiration and creativity. That was so heartening. Then one of those aha! moments occurred from a serendipity or universal poke when presented with a quote from a remarkable woman, Maya Angelou, who said that “You can’t use up creativity. The more you use the more you have”. Self doubt, and this I should know, destroys creativity and is a trap that is all too easy to fall into. For Christmas my daughter gifted me some pieces of wool felt. One piece is a rich, grassy green, just perfect to make a little frog. A little frog that has a tale to tell of how important he is in the whole scheme of things. Frogs are important to the ecology and rapidly disappearing from the landscape, through agricultural practices, especially the use of pesticides, population growth and inbalance in the whole connection of life forms in nature as urban sprawl infiltrates and unbalances eco systems. The character that grew from the felt was not quite like the sketches that have been made over time, as the idea has been simmering for a bit, but seemed to dictate the process. However, as he took form, it was apparent that he needed a mouth, and not the embroidered mouth that was in the original design but a mouth that opens and closes; a talking mouth as he has a story to tell. Again it was there waiting all the time, those little ovoid scraps lying on the table were a perfect fit . Now he needs a setting, perhaps a pond , or a lily pad, or a log. Any ideas? At the same time two little heads were in a box and waiting for bodies. 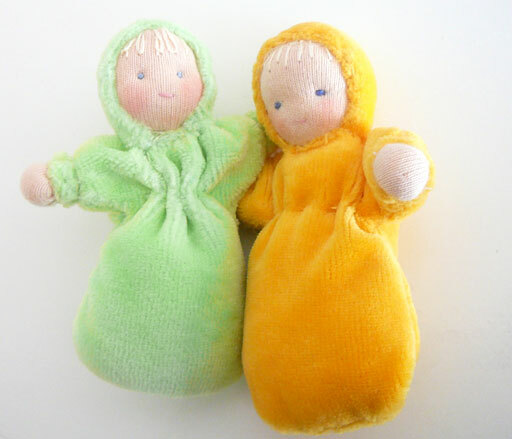 These have become very typical, tiny, Waldorf babies; little comfort or pocket dolls. They were an absolute joy to make. Something about a baby instils new hope. These did that. 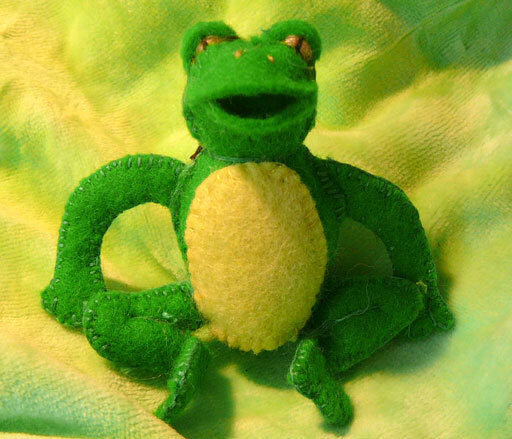 A frog to create awareness and love for nature and babies to remind of renewal and hope. This has turned out to be a powerful lesson , pointing out that from the ashes of tomorrow there will be a new day glowing with promise and opportunity, full of inspiration and creativity. I love me some clutter. That looks just like my craft area, only what comes out of it isn’t quite so cute. We love to grow frogs in the summer and to catch and visit with toads for a bit. I’d be sticking one of those sweet babies in my pocket. What an inspiring post, I am so sorry to see what the fires have down in your country, my heartbreaks at the devistation, but its nice to see positive posts like this is the midst of such sadness, and what precious creations! I really like what you wrote about frogs, we have been talking about frogs in our playgarden this month, I am learning so much about how amazing this little creatures are. Your little comfort friends are so cute! My little one would love something like that.